ColdCure® Achilles Wraps are designed to relieve the pain and swelling associated with injuries and conditions in the back of the ankle. Achilles Tendonitis, Achilles Tendon Tears, Achilles Tenosynovitis, Achilles Paratenonitis and Achilles Tendonosis can all be treated with your Achilles ColdCure® Wrap. 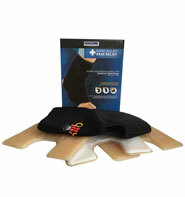 The ColdCure® Achilles Wrap comes with gel packs that are custom designed for the shape of the back of the ankle. The unique design of these gel packs ensures the best treatment and coverage possible. The Achilles gel packs mold all the way up the length of your Achilles Tendon, as well as around both sides. Our gel packs have many unique features that other packs simply don't have. One is called RigiGel® technology. RigiGel® isn't watery like other gel formulas. This means it stays in place to treat your Achilles, and doesn't migrate to other areas of the pack like gooey blue gel does. RigiGel® is actually unmoveable under pressure. It remains firm enough to stay in place, but flexible enough to mold comfortably to your Achilles. 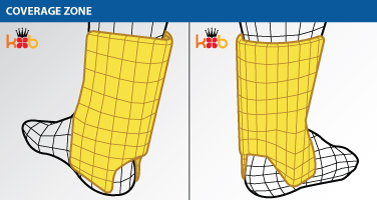 Our packs contain 10x more gel than other packs, for maximum coverage of your Achilles. The quality of our wraps is reflected in the comfort. They are made of soft, flexible neoprene that conforms perfectly to your body. 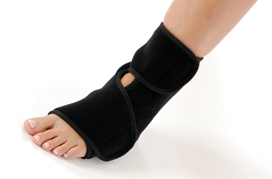 The Velcro® straps allow you to adjust the wrap and find the right fit for your ankle. The Achilles Wrap is made of 100% biocompatible materials. Since this is a medical device, the materials must meet very high standards of quality and safety. These materials are actually safer than those used for most baby products, including toys, clothing and diapers. The ColdCure® Achilles Wrap comes with 3 swappable cold packs. You use one gel pack inside the wrap during treatment, so you can have the other two charging in the freezer to swap in and out throughout the day.